In this tutorial you will learn how to use ViSP either on unix-like operating system (including OSX, Fedora, Ubuntu, Debian, ...) or on windows. 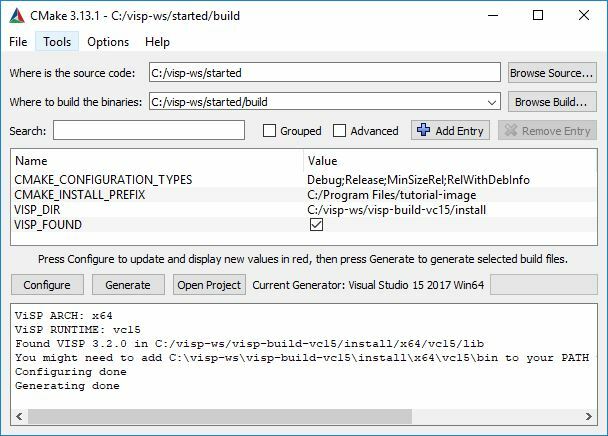 The easiest way of using ViSP in your project is to use CMake. If you are not familiar with CMake, you can check the tutorial. 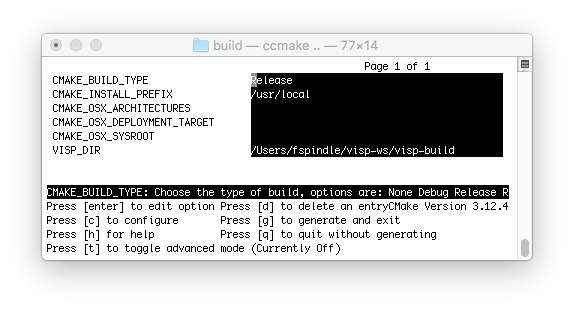 In this section we show how to build a CMake project that uses ViSP as third-party on a unix-like OS. As a use case we will use the image project that is part of ViSP tutorials. The source code comes from https://github.com/lagadic/visp/tutorial/image. If you did Installation from packages you have to create a workspace. If you did Installation from source code jump to point 2. since your workspace should be already created. 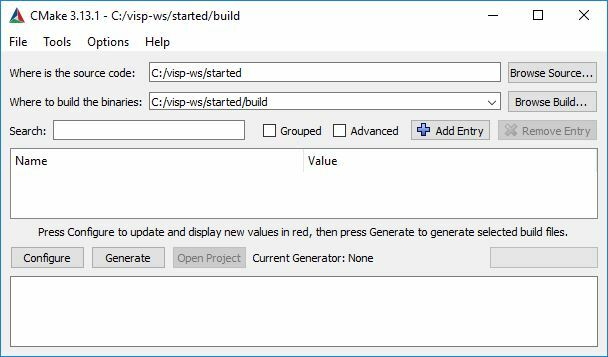 In this section we show how to build a CMake project that uses ViSP as third-party on Windows. As a use case we will use the image project that is part of ViSP tutorials. The source code comes from https://github.com/lagadic/visp/tutorial/image. If you did Installation from source code jump to point 2. since your workspace should be already created. Run CMake in build folder and indicate where to find ViSP thanks to VISP_DIR var. We suppose here that you have already setup a workspace and defined VISP_WS environment var. Let's start to write our first C++ example to see how to read an image and open a window to display the image with ViSP. This example is provided in tutorial-viewer.cpp example and given below. Open your favorite editor and copy/paste the content of this example in VISP_WS/started/tutorial-viewer.cpp source file. Include all the headers for image viewers. The two first one are for Windows systems. They require that Direct 3D or the Graphical Device Interface (GDI) coming with the installation of Visual Studio are available. The third one needs GTK that is cross-platform. The fourth is for unix-like systems and requires that libX11 is available. The last one is also cross-platform and requires that OpenCV is available. 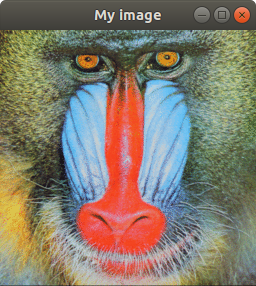 Include the header that allows to read/write PGM, PPM, PNG and JPEG images from the disk using vpImageIo class. Create an instance of a color image where each pixel is coded in RGBa. The image I is initialized by reading an image file from the disk. If the image format is not supported we throw an exception. Create an instance of an image display window for image I. The first viewer that is available is used. 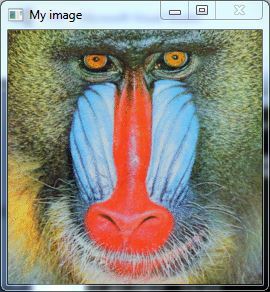 Here we create the link between the image I and the display d. Note that an image can only have one display. The title of the display is then set to "My image". First we display the content of the image I, then we flush the display to render the image. Here we handle mouse events. We are waiting for a blocking mouse click to end the program. Now you have to create a CMakeLists.txt file that gives the instructions on how to build tutorial-viewer.cpp example. A minimalistic CMakeLists.txt should contain the following lines. Open your editor and copy/paste the following lines in VISP_WS/started/CMakeLists.txt file. Here after we explain the content of the CMakeLists.txt file. In this section we supppose that you have created a folder $VISP_WS/started that contains CMakeLists.txt, tutorial-viewer.cpp and monkey.ppm files. 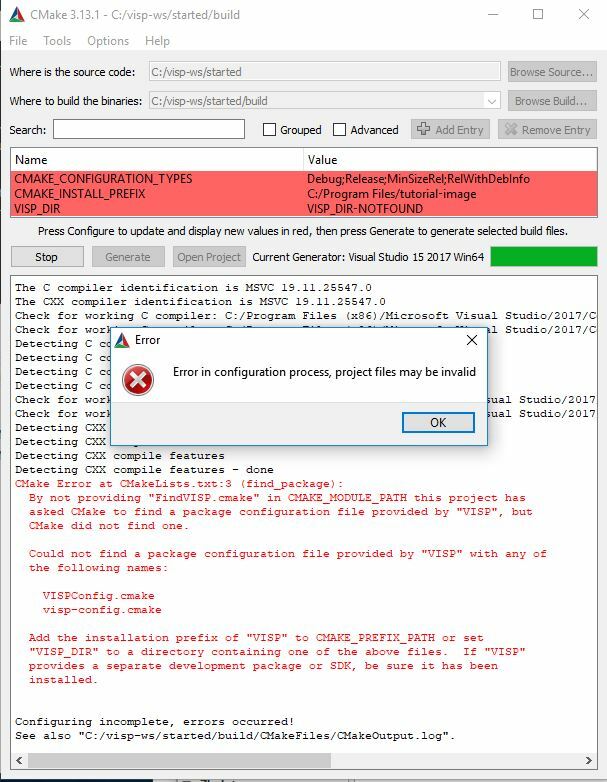 If you get the previous error it means that you forget to set VISP_DIR environment variable that helps cmake to find VISPConfig.cmake file. $ sudo apt-get install libvisp-dev. We suppose from now, that you have created a folder %VISP_WS%\started that contains CMakeLists.txt, tutorial-viewer.cpp and monkey.ppm files. Launch "CMake (cmake-gui)" from Windows "Start" menu. Set the source code location as %VISP_WS%\started and the build location to %VISP_WS%\started\build folder. Press "Configure" button and select your compiler. In our case we will use Visual Studio 15 2017 Win64. Press then "Finish" button. The configuration is now under progress and should lead to the following image. 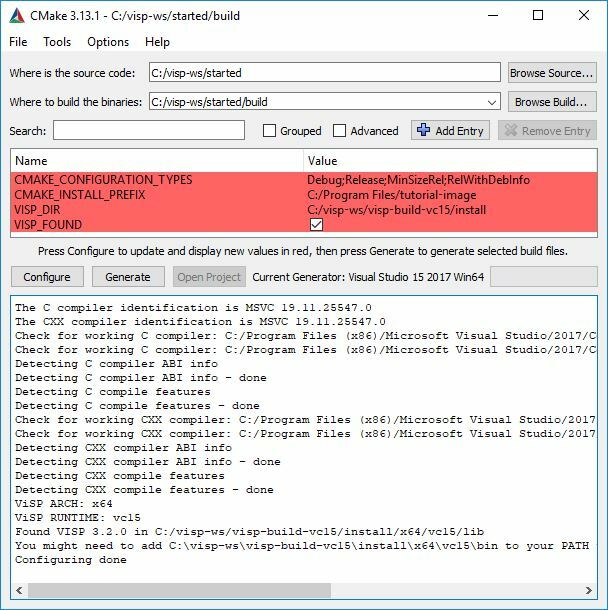 In the previous image you may notice that CMake has automatically found the location of ViSP install folder; %VISP_WS/visp-build-vc15/install. This was possible because you Set VISP_DIR environment var. If at this step you have an error like the one shown in the next image, it means that you forget to set VISP_DIR env var. If this is the case, quit CMake Gui, Set VISP_DIR environment var, open CMake Gui and try again to configure your project. Press then "Configure" button to remove the red lines, and then "Generate" button. As presented in the following image, all the red lines should disappear. 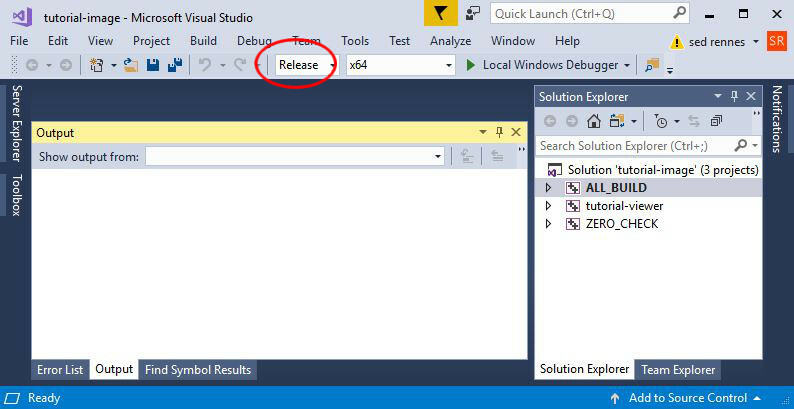 From now, in %VISP_WS%\started\build folder you should have tutorial-image.sln Visual Studio solution file. 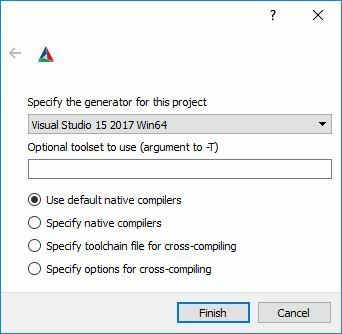 Open the project in Visual Studio C++ just by double click on %VISP_WS%\stated\build\tutorial-image.sln solution file. 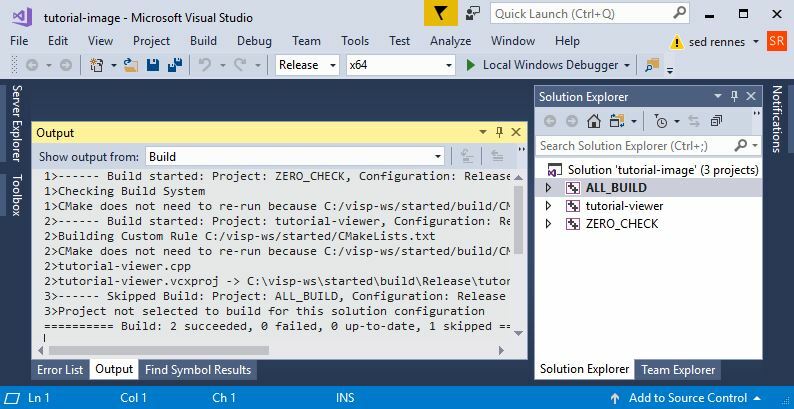 Modify the configuration to "Release"
Now to build the solution, enter "BUILD \> Build Solution" menu or hit Ctrl+Shift+B keys. In %VISP_WS%\started\build\Release folder you have now tutorial-viewer.exe executable. In your "Start" menu click on "Run" and type in cmd.exe to run a Command Prompt. You are now ready to see the Tutorial: How to display an image. There is also the Tutorial: How to extend ViSP creating a new contrib module that could be useful to understand how to introduce new developments in ViSP.